Stop Press: Andrew and Jules from Paddy’s Whiskers are relocating to the Isle of Skye in Spring 2019. We will be in the South West for some gigs at the end of May and in August – and have a few more free dates then…so if you are interested, please get in touch. Footstompin’ live Irish, Scottish and American music. 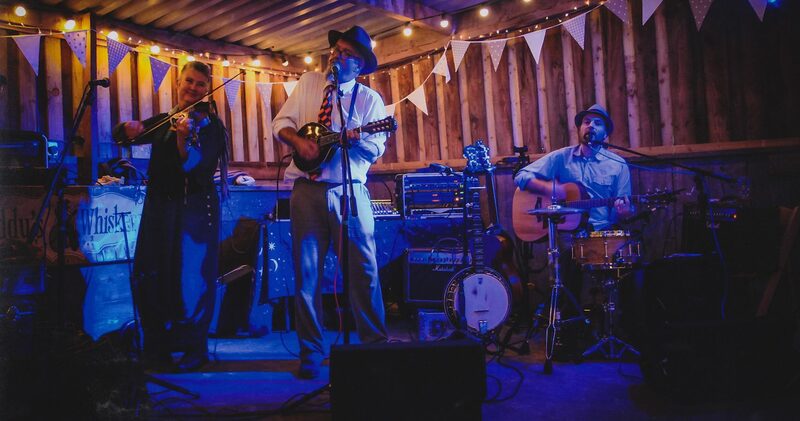 Devon based band playing traditional songs and tunes in an upbeat contemporary style. Full on Irish jigs and reels, rollicking border bagpipe tunes, haunting slow airs, banjos and fiddles twisting and turning to weave intricate melodies…..Recently featured on BBC1, Paddy’s Whiskers play at festivals, gigs, pubs, ceilidhs, barn dances, weddings and parties across Devon, Cornwall, Somerset and the South West. Paddy’s Whiskers play folk music with a slightly harder edge…faster…more street wise..Inspired by The Pogues, The Clash, The Chieftans, Altan, Dervish…..formed after years of travelling and playing street music…The Whiskers bring good vibe to any event. If you are interested in booking Paddy’s Whiskers or Re-Jig (duo), or if you would like further information, please email us at info@paddyswhiskers.co.uk or call Andrew or Jules on 01803 520798 or 07514064558. Paddy’s Whiskers play footstompin’ Irish, Scottish and American music in a contemporary and upbeat style. We are proud to provide great barn dances and ceilidhs at weddings and parties across Devon, Somerset, Cornwall and the South West.